Lawyer Advertisements on iPhone applications? After the end of a wearisome day practicing law, we here at Abnormal Use often like to review the news of the world (or, more likely, our friends’ social media updates) on our iPads or iPhones. Sure, we receive legal news via the same medium, but it has become a tradition to peruse the Internet and our favorite social sites at the end of any given business day. Recently, we thought that we might have enough free time to see a movie, but not knowing what was playing at the local theatre, we downloaded a certain movie times mobile app. It’s one of those magical programs that utilizes your phone’s GPS function to locate the nearest movie theatre and provide you its schedule of showings. We continue to marvel at that type of technology, even though after several years of its use and popularity, it really should cease to amaze. (An aside: Imagine telling yourself in 1997 that you would one day, in the not so distant future, be able to utilize your mobile phone for such things. Science fiction, we would have thought.). However, our quest for cinematic enjoyment was interrupted by something sinister. Vexing as it is, some of these apps, particularly the free apps, maintain advertising to support their operations. There is nothing inherently wrong with this approach, although advertising on one’s mobile phone, particularly on mobile apps, is really, really annoying. Of course, that’s the compromise we make in able to enjoy free apps that allow us to unlock the magic of today’s mobile telephone technology. Usually, it’s all good. But there was something peculiar about the ad which popped up in the app that day. The reader is then called upon to click the “Learn more” button to investigate and, presumably, learn more about the offer. Who is this advertisement targeted towards? 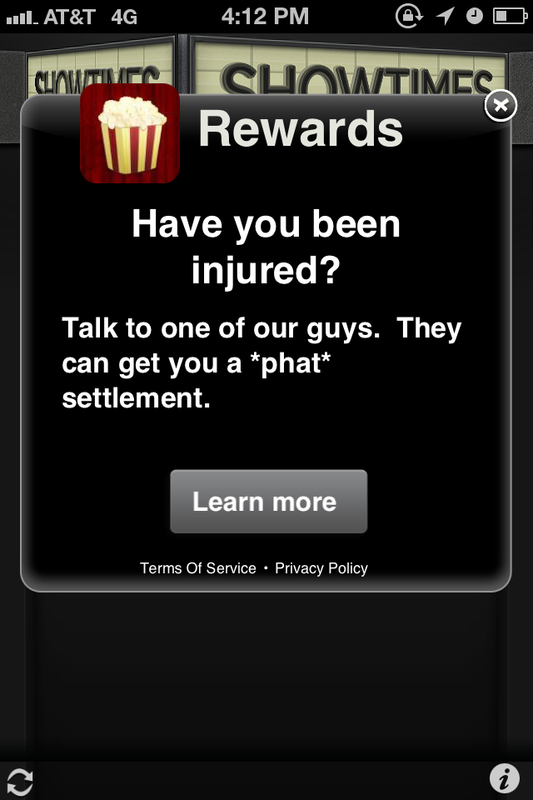 Is there a significant enough market of movie time seeking smart phone users with potential personal injury claims that such an app is rewarding? The ad suggests that the reader “talk to one of our guys,” although it is unclear whether one of the “guys” is in fact a lawyer (not to mention the implications for diversity of the profession by mentioning only “guys”). Further, there appears to be no disclaimer or geographic reference to be found in the advertisement. Although we must confess we did not click the “Learn more” button for fear of what might happen if we did so. Perhaps some braver souls than we can do so and report on the results of that endeavor. Oh, and after all of this, we decided not to see a movie. Looks like a 3rd party lead generation service.